Product prices and availability are accurate as of 2019-02-26 15:54:18 EST and are subject to change. Any price and availability information displayed on http://www.amazon.com/ at the time of purchase will apply to the purchase of this product. 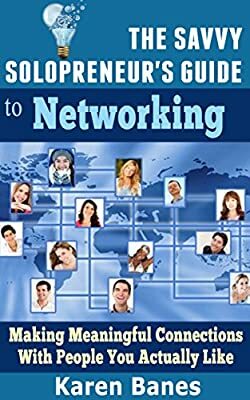 This short, no-fluff guide to networking is aimed at helping you make stronger, more meaningful connections with the right people, without spending an overwhelming amount of time on your networking activities. This is the third ebook in The Savvy Solopreneur series, aimed at anyone who works as a entrepreneur with no full-time employees. If you're a blogger, author, network marketer, coach or online tutor, you're probably a solopreneur. If you have collaborators, affiliates and a team you outsource to, but no employees that rely on you for a full-time wage, you're probably a solopreneur. If you feel like your business only runs if you do all the tasks associated with it, you're a solopreneur. If this sounds like you, take a look at this book, and let's start using your networks to support you and work for you, using strategies and processes that actually work. This is not a book about specific social media platforms (although we’ll certainly look at using social media as part of your networking activities). It takes a big picture approach to networking, covering strategies and tactics that will work for any business and on any platform. Each chapter has action lists to help you put into process everything you learn as you go through the book.